A mother of four, forced to flee Iraq as a result of the war, has sued ex-President George W. Bush and five former underlings for aggression. Although she wants to sue them as private individuals, the U.S. Department of Justice has taken up the cudgels for the six. 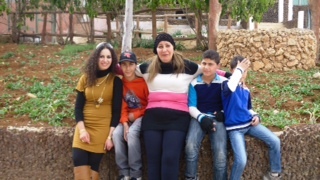 The lawsuit is meant to be a class action, though so far the only one named is Sundus Shaker Saleh, divorced, now living with her children in Jordan. She used to live in Jalawla, Iraq. There, she and her family owned a jewelry store; she also taught art and worked in private galleries. Life was peaceful. Doors were often unlocked. But the invasion brought anarchy and religious strife. Kurdish militants allied with the U.S. forced Ms. Saleh and the children to abandon their home. The five moved to Baghdad, where militant Shia Muslims made repeated threats for several months. They considered her an infidel, because she belonged to the Mandean sect. A car was rammed into hers, and the house that she and children lived in was fired upon. So the family fled to Jordan, which offered safety but not steady work. A San Francisco lawyer, D. Inder Comar, usually an attorney for private companies, represents her (pro bono). Besides George W. Bush, the defendants named are ex-Vice-President Richard B. Cheney; Donald H. Rumsfeld, former secretary of defense; Condoleezza Rice, former national security advisor; Colin L. Powell, former secretary of state; and Paul M. Wolfowitz, former deputy secretary of defense. The case was filed in the U.S. District Court for the Northern District of California, San Francisco Division, in March 2013 (and filed there again, in amended form, the following September). It is not yet certified as a class action, nor has a court date been set. The complaint alleges that the defendants “broke the law in conspiring and committing the crime of aggression against the people of Iraq.” It says they are liable as individuals because they planned the war as early as 1998, before they took office, and because neither planning nor carrying out aggression was part of their employment. On the other side, the Department of Justice insists that this is a case of government employees doing their jobs and that the government has sovereign immunity from suit. It certified, on August 14, that Bush and the others acted within their “scope of employment” in planning and waging the war on Iraq. The department cites the Westfall Act of 1988, granting immunity to government employees for actions taken within the scope of their employment, except for violations of the Constitution or a statute. Anyway, the department contends, whatever the defendants did involved a “political question,” beyond the jurisdiction of any court. It presents its general position in a motion to dismiss, filed last August 20. “The laws that the complaint accuses the defendants of violating are entirely international: (1) the Kellogg-Briand Pact (1928), in which the U.S. and other signatories condemn war for solving international controversies and renounce it as an instrument of national policy; (2) the United Nations Charter (1945), requiring members to refrain from the threat or use of force against the territorial integrity or political independence of any country; (3) customary international law, which precludes conspiracy to wage aggressive war, as well as aggression itself. “The crime of aggression was the chief crime prosecuted at Nuremberg and is the ‘supreme international crime,’” says the complaint, quoting from the tribunal’s ruling against condemned Nazis. The U.S. recognized aggression in violation of Kellogg-Briand as a capital offense in prosecuting Nazi and Japanese leaders under both the Nuremberg and Far East Tribunals. In the case of Nixon v. Fitzgerald (1982), the Supreme Court ruled, by a 5–4 vote, that the U.S. president is immune to civil suits for actions taken in pursuing his official duties. Ms. Saleh seeks both compensatory and punitive damages, in amounts to be determined at trial. She asks the court to order defendants to arrange a restitution fund to compensate all Iraqi civilians whom the defendants damaged. She wants a trial by jury. Northern California is said to be an acceptable venue, inasmuch as defendant Rice lives there and, anyway, the alleged deeds were not committed in just one district. The complaint says the court has jurisdiction under the U.S. Code, Title 28, Section 1350. Passed in 1789 by the first Congress and called the Alien Tort Statute, it says, “The district courts shall have original jurisdiction of any civil action by an alien for a tort only, committed in violation of the law of nations or a treaty of the United States.” The Constitution, Article I, Section 8, paragraph 10, gave Congress the power “To define and punish … offenses against the law of nations,” which today we call international law. Deciding whether or not to go to war is the sole prerogative of Congress, as framers of the Constitution and early court decisions clearly established and as stated repeatedly on this web site. So in starting the war, was Bush really acting within the scope of his employment, as the government contends? Or did he instead usurp the constitutional function of Congress? In 1998, Rumsfeld and Wolfowitz signed a letter to President Clinton, calling for a military conquest of Iraq. Wolfowitz similarly testified in Congress, advising that a provisional government be formed to control Iraqi oil. Bush focused on Iraq even before September 11, 2001, e.g. discussing ways to justify an invasion with General Tommy Franks, the U.S. central commander. Following 9/11, the administration sought to use the terrorist acts (involving no Iraqis) as “an opportunity to attack Iraq,” to quote Rumsfeld’s instructions to his staff. Cheney lied, on “Meet the Press,” that a meeting between the lead hijacker and Iraqi intelligence was “well confirmed” (12/8/01), though both the CIA and FBI had concluded that probably no such meeting took place. Bush met Prime Minister Blair (1/31/03) and talked of provoking Iraq to justify a U.S. attack. The White House formed an Iraq Group to convince the U.S. public to support war on Iraq. Fabricated intelligence from unreliable sources was used. Rice, e.g., lied on CNN that Saddam Hussein was “actively pursuing a nuclear weapon…. We don’t want the smoking gun to be a mushroom cloud” (9/8/02). Ten days after 9/11/01, the CIA told Bush that no evidence linked Iraq to the attacks and that evidence of collaboration with al-Qaeda was scant. Moreover, Defense Intelligence reported allegations of links between the “intensely secular” Iraq and Islamic revolutionists to be fabricated (2/2/02). Nevertheless, Bush lied to the public that “Iraq and al-Qaeda have had high-level contacts that go back a decade…. Iraq has trained al-Qaeda members in bomb-making and poison and deadly gases” (10/7/02). Cheney lied that the White House knew “with absolute certainty” that aluminum tubes acquired by Iraq were for nuclear weapons — despite strong evidence that they were unsuitable for that purpose (September 2002). Rice and Powell similarly lied. Bush claimed, in a radio talk, that Saddam “could launch a biological or chemical attack in as little as 45 minutes.” In Bush’s 2003 State of the Union address, he said that Iraq was seeking uranium from Africa — though he had been informed that it was highly unlikely. The International Atomic Energy Agency found no indication of renewed nuclear activity. UN inspectors found no evidence of Iraqi chemical weapons or capability to produce them. Yet Bush said in a speech, “We know that the regime has produced thousands of tons of chemical agents, including mustard gas, sarin nerve gas, VX nerve gas” (October 2002). It was all a lie; such weapons were never found. The Obama administration stands in the way of Britain’s publication of a four-year study of how that nation came to wage war on Iraq. The White House and State Department want to suppress all the correspondence between President George W. Bush and Prime Minister Tony Blair. So reported the U.K. newspaper The Independent (11/14/13). The documents are said to furnish evidence for parts of a report that condemns “the covert way in which Mr. Blair committed [45,000] troops to the U.S.-led invasion,” quoting the paper. It had disclosed earlier in 2013 that drafts of the report challenged the official version of events. Headed by Sir John Chilcot, a former diplomat, the Iraq inquiry was launched in 2009 by then Prime Minister Gordon Brown. Among hundreds of documents that Chilcot wants in his report are exchanges of notes and records of conversations between the two erstwhile leaders. If the U.S. will not permit their publication, the result may be a report that is devoid of evidence or heavily redacted. Obama began his first term by informing government executives of his plan to create “an unprecedented level of openness” and “a system of transparency.” We see how that worked out.